remains open, 13 months after Justice Kathryn Werdegar retired. Nearly 26,000 people tuned in last year to watch oral arguments online, with real-time captioning in both English and Spanish. 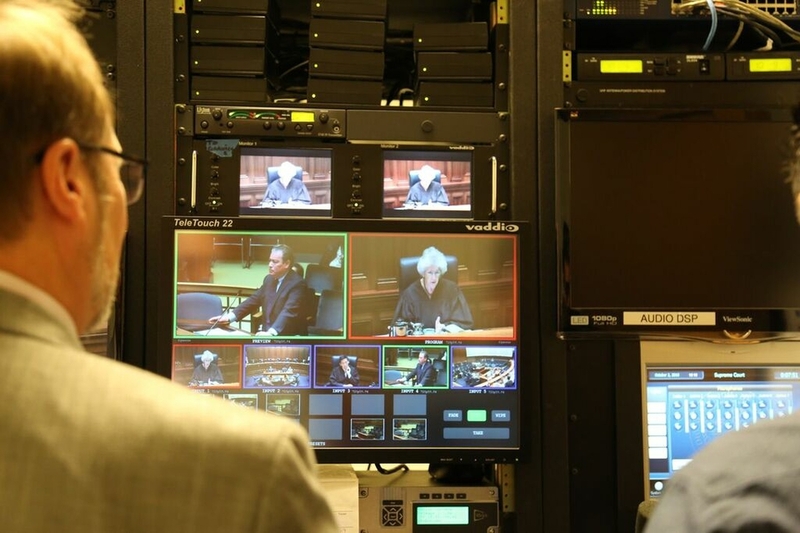 The streams garnered more than 13,000 views of the live oral argument sessions, and more than 12,000 views of the archived sessions on the permanent archive of the court’s website. This is the court’s second year live streaming oral argument sessions, making good on a pledge by Chief Justice Tani Cantil-Sakauye in her 2016 State of the Judiciary address to make the court more transparent and open to the public. Some of California’s intermediate appellate courts also have begun offering live streaming of their oral arguments. As part of the Supreme Court’s ongoing efforts to improve transparency and enhance access, middle school, high school, university, and law school students continue to visit the court’s Los Angeles, Sacramento, and San Francisco courtrooms to hear oral arguments. This court year, 15 school groups totaling more than 250 students visited a Supreme Court courtroom for an oral argument session. These groups included international law school students from Germany, South America, and Mexico. The control room that brings live video of Supreme Court arguments to thousands. As Governor Jerry Brown’s term comes to an end, increased attention has turned to those prisoners whom he may seek to pardon, or whose sentences he may seek to reduce, before leaving office. But in order to grant clemency to those convicted of two or more felonies, the California Constitution requires that a Governor must first get the “recommendation” of a majority of the state Supreme Court’s justices. Pursuant to this understanding, through August of this year the court allowed 11 pardons or commutations submitted by Governor Brown to proceed for his final decision. For the first time in nearly three decades, the California Supreme Court approved a comprehensive overhaul of attorney ethics rules as part of its duty to regulate the legal profession. The court approved 42 rules as modified by the court, 27 rules as submitted by the State Bar, and denied approval of one rule. Notably, the court adopted the ABA Model Rules numbering system, which is intended to ease cross-referencing with other states’ rules and relevant case law. Among the significant changes to the rules themselves is rule 8.4.1, which will continue a current prohibition on unlawful discrimination or harassment by attorneys, but will no longer require a final civil or administrative adjudication of unlawful conduct as a prerequisite to a State Bar investigation or issuance of charges. The court also approved rule 1.8.10, which will for the first time impose a bright-line ban on sexual relations with a client unless a previous consensual relationship existed. Rule 1.2.1 will continue an existing ban against assisting or advising a client with violations of law, but will now provide guidance for lawyers advising or assisting a client who wishes to comply with a California law that may conflict with federal or tribal law. The court also approved new rules specifically governing attorney supervision of subordinate attorneys and legal support staff (rules 5.1 and 5.3) and imputation of conflicts (see rules 1.10, 1.8.11, and 1.18(c)). These are but a small sampling of the many significant changes to California lawyers’ ethical duties and responsibilities effective November 1, 2018. All lawyers are strongly encouraged to consult the State Bar website for more information about all of the new rules. The court in May also approved a new rule of court requiring all active California-licensed attorneys be fingerprinted by December 1, 2019. The rule will permit the State Bar to meet a statutory requirement that it retain each active licensee’s fingerprints for the limited purpose of ongoing criminal arrest notification. Proposition 66, approved by the voters in the November 2016 election, added and revised numerous statutory provisions regarding California’s system of capital punishment. On request of those challenging the proposition as unconstitutional, the Supreme Court stayed implementation of the statutory changes while it considered those claims. The court ultimately upheld the proposition in Briggs v. Brown (2017) 3 Cal.5th 808, and in late October 2017 the proposition went into effect. A major area of change under Proposition 66 concerns the adjudication of habeas corpus petitions, by which inmates can challenge the legality of incarceration outside the limits of a normal appeal. In the past, these petitions in capital cases were almost universally filed and litigated directly in the Supreme Court. Proposition 66 established a preference to shift the adjudication of death penalty habeas corpus petitions from the Supreme Court to the superior courts (trial courts) that imposed the death sentences. Although full implementation of the proposition’s changes is an ongoing process, the Supreme Court has already taken actions reflecting the proposition’s intent to move these habeas corpus matters to the superior courts. For example, over the 2017-2018 year in 14 cases the court directed that proceedings historically taking place in the Supreme Court would instead be conducted in the superior court in which the trials were held. 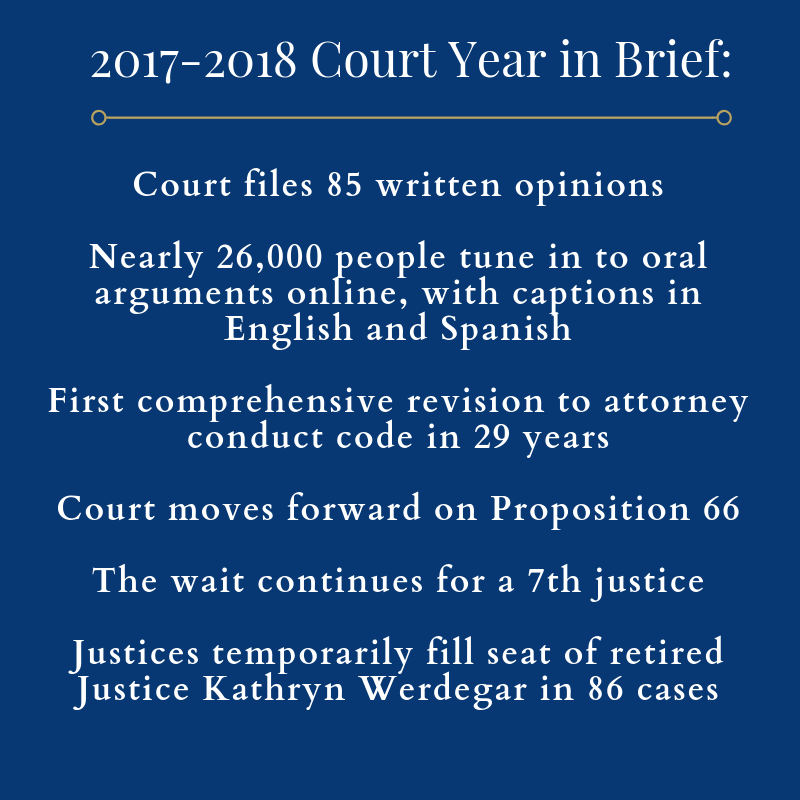 In January, the Chief Justice, as chairperson of the California Judicial Council, appointed a council working group to develop rules, forms, and other measures to implement aspects of Proposition 66 that impact court functions. The working group will submit its recommendations to the council for approval, with implementation expected by spring 2019. It has been 13 months and counting since Justice Kathryn Werdegar stepped down from the California Supreme Court, making it by far the longest vacancy in the court’s history. For the 86 Supreme Court cases argued in the past court year (Sept 2017-August 2018), the high court tapped Court of Appeal justices to sit “pro tempore” (Latin for “for the time being”) as fill-in justices until a new permanent Supreme Court justice is sworn in. Once a case is set for oral argument, court officials consult an alphabetical roster of appellate court justices in order to gauge availability to serve as a fill-in justice. The court assigns a pro tem justice to each case, which the Court of Appeal justice handles in addition to his or her own regular court caseload. Some appellate justices have now sat multiple times to fill the current Supreme Court vacancy. Court of Appeal Justice Laurence D. Rubin enters the courtroom to serve as justice pro tempore on the California Supreme Court. * One Superior Court Appellate Division opinion was also ordered published.